As their slogan says, America runs on Dunkin, but some parts of India seem to as well! I stumbled across one of these while walking around Delhi. The donuts are all eggless (a popular way of making pastries here) and they actually were really delicious. Much fresher tasting than the Dunkin’ Donuts in the US, which are often dry and crumbly. 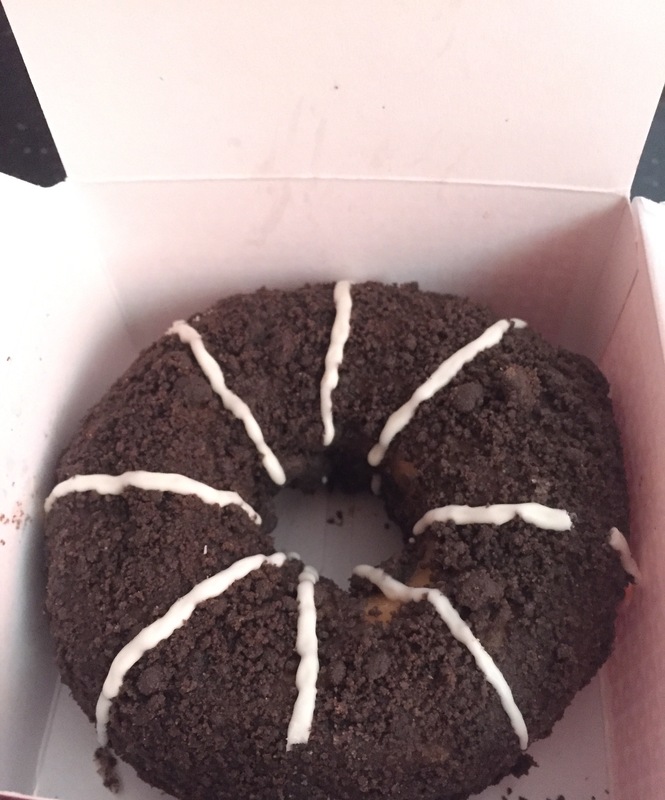 Flavors were fun too – such as the mango icing donut. Most stores are called Dunkin Donuts & More so they offer sandwiches and smoothies as well. Iced coffee had a nice coffee taste, and was significantly less sugary (I don’t know why the US branches pile on the sugar – always makes me feel like I’m about to have a sugar heart attack). It’s often hard to find filter coffee in many parts of India, so it was nice having some good coffee that wasn’t expensive. You won’t find any beef products here, but you’ll find some veggie and chicken “burgers” for cheap, as well as some tasty “softies” or ice cream cones. Some burgers have a thick cheese spread that’s actually pretty tasty. Other burgers have an Indian flare to them, such as masala flavorings. And the fries were some of the best I’ve had in India, and I normally don’t like Burger King fries! Pretty true to the global chain, but the iced coffee was just straight coffee, so it was very strong. I only went to Starbucks twice, and each time I didn’t see any syrups, though I saw you can add caramel or vanilla to iced coffees. Also, the drinks and pastries were definitely not the same prices as food in India is “normally” priced. My friend spent about 350 rupees ($5.46 approx.) on her frappe. You can get a meal at a restaurant for 100 rupees ($1.56), sometimes even less. 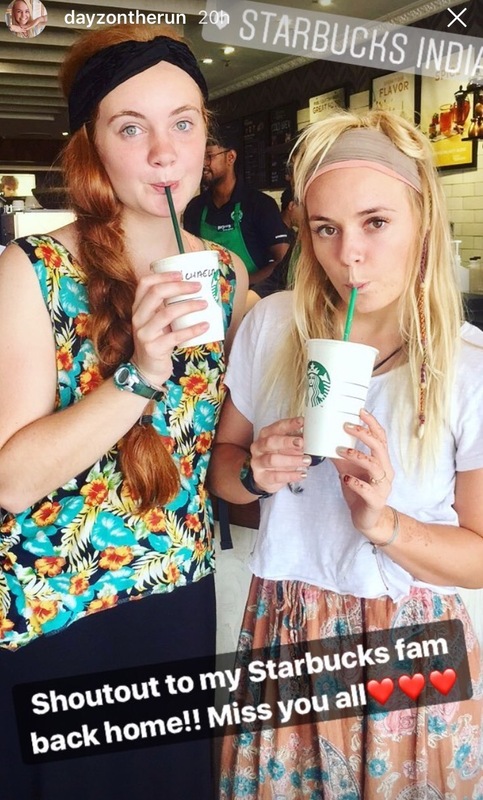 When your best friend use to work at Starbucks in the US, you know you’ll be trying it when you’re traveling! 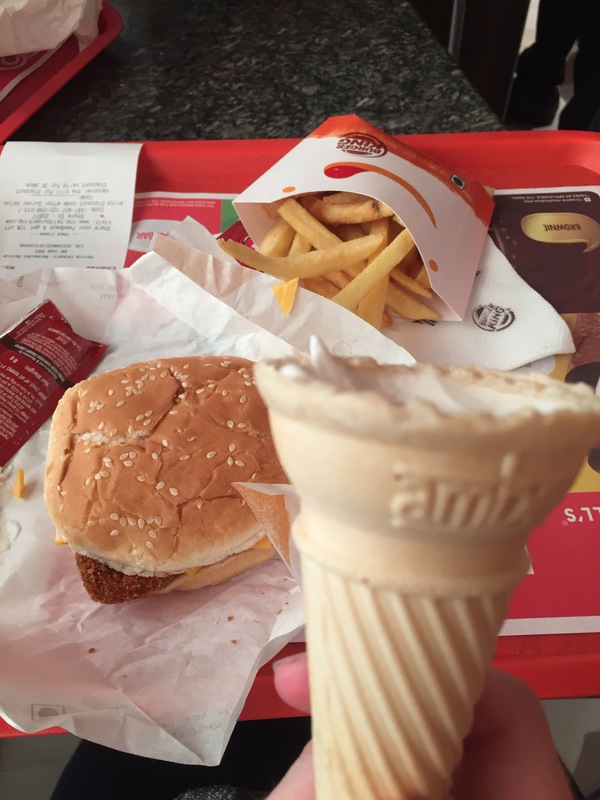 I also tried a 20 rupee ice cream cone, or “softy” at McDonalds. Ice cream was good, and the menu is pretty similar to Burger King with veggie burgers. Don’t expect 5-star dining, but then again, who really expects that from any American fast food joint? The food may be cheap here, but you might as well try some street food or even some of the local restaurants for the real, tastier flavors of India! It’s probably even cheaper than some items on the chain restaurant menus too. Have you eaten at any of these restaurants abroad? What did you think? Let me know in the comments below.